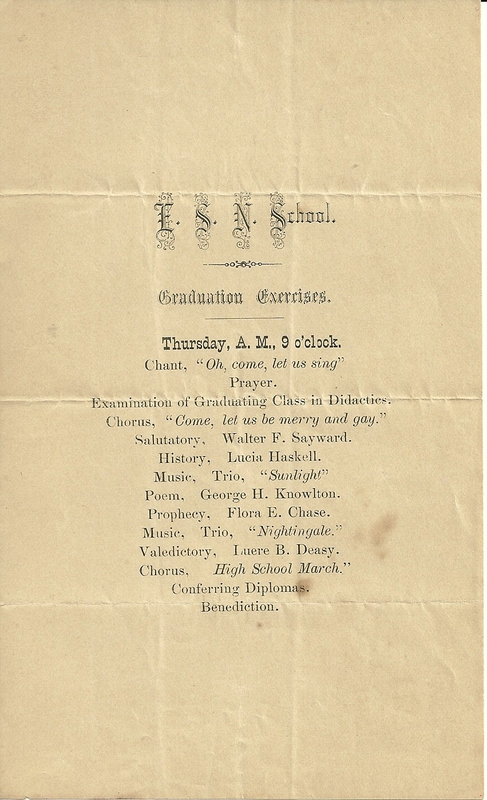 George Henry Haskell, noted in the above graduation exercises as the reader of a poem, was born about December 1856 at Sangerville, Maine, in Piscataquis County, the son of Henry and Lucinda Jane (Harlow) Knowlton. 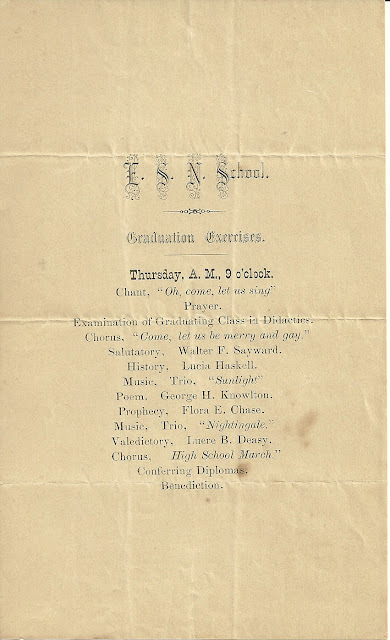 An earlier post contained scanned pages of the graduation exercises program and the entire catalog of Eastern State Normal School in Castine, Maine, for the year ending June 3, 1881. It contains names and home towns of the trustees, faculty and students, including George H. Knowlton. George's paternal grandparents were Isaiah, Jr. and Clarissa (Spooner) Knowlton of Sangerville, Maine. His maternal grandparents were Asa and Polly Leach (Low) Harlow of Parkman, Maine, also in Piscataquis County. George Henry Knowlton married Catherine S. Foye about 1889. She was born about June 1859 in Maine, the daughter of Robert H. and Catherine Jane (Bond) Foye of Montville, Maine. Her paternal grandparents were Robert and Sarah Foye. Her maternal grandparents were David Gilmore Bond and wife Sarah Oliver (Nichols) Bond. According to the 1900 Census of Chelmsford, Massachusetts, George was a School Superintendent. Perhaps he had also been a superintendent at Bridgewater, Massachusetts earlier, or a teacher. Catherine S. (Foye) Knowlton died of a fractured skull on 26 August 1900. The death record contained some wording that might have explained the death, but I couldn't make it out. George Henry Knowlton married Laura Hart Dresser on 5 August 1902 at Bridgton, Maine. She was born 18 June 1852 in Bridgton, the daughter of Joseph W. and Harriet N. (Frost) Dresser. Her birth date was taken from a birth record, but most other records show her as the same age as George, who was born about 1856. The birth record was a copy of an old record and could have contained an error. George and Laura lived at Vassalboro, Maine. They're in the 1910-1930 Censuses of Vassalboro, with George listed as a farmer.